I have ridden my mountain bike in a lot of great places in this country. California, Moab,the Pacific Northwest, Colorado, but I have to tell you , last Saturday was one of the best days on the bike- ever! Aaron Shafer put together a ride to and through all the city parks in Pittsburgh,Pa. my home town. Don Cunningham encouraged me along with some others to attend. Aaron is the fit guy in the red jersey who had the bright idea and we all met at his instruction at the Grist House Brewery in Millvale, Pa at 8:00 A.M. After a cruise on the bike path along the Allegheny River accompanied by the early morning scull crews, we ascended Federal Street- one of the steeper climbs in the city to the entrance of Riverview Park. Now, the 25 or so riders had a variety of different bikes for the occasion. Guys showed up with road bikes but had no chance of riding a trail with them. Aaron, who is a skilled rider, had a cross bike along with some others. A good choice but personally, I was happy I had my mountain bike for many reasons including comfort with fat tires, dual suspension, and upright bar positioning. Lots of others had the same idea. Riding the technical trails of Riverview was a treat with the dry conditions. Moving on to the North Shore Trail by way of Woods Run, we made our way across the river and rode around the beautiful fountain that is the showpiece of our Golden Triangle. 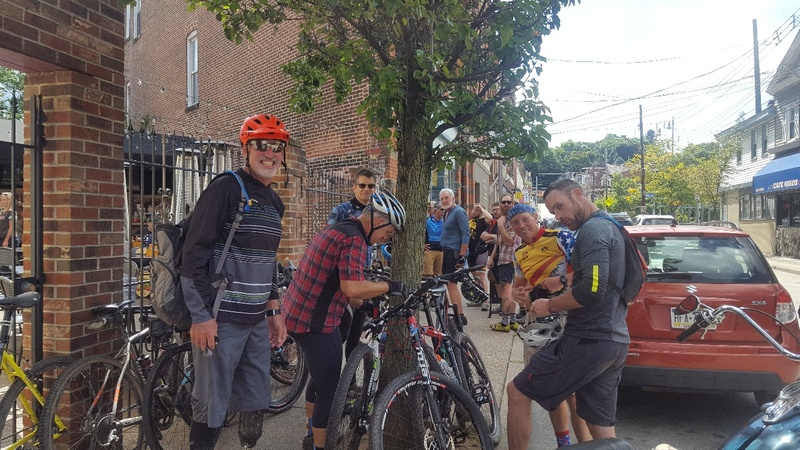 The group pedaled along to the historic South Side with the intent of eventually making our way up Mt. Washington. 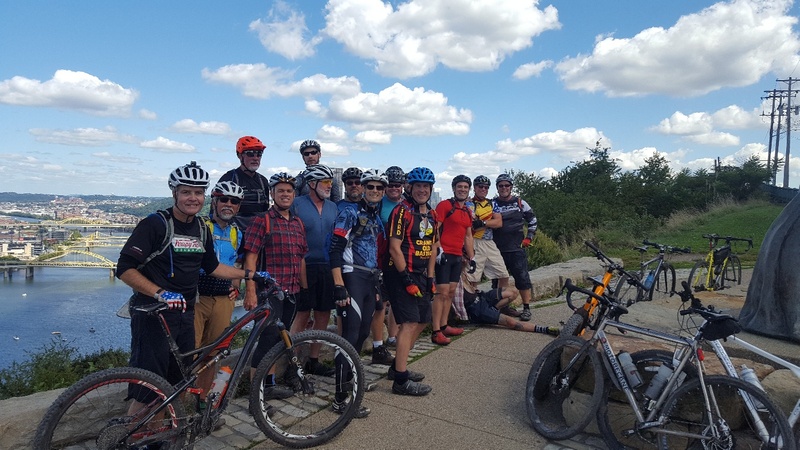 We lost some folks along the way with that news and the group split with some of the hardier riders taking a twisty technical trail to the top of Mt. Oliver to Mt. Washington, while the rest pedaled the long climb up 18th Street. I have lived here most of my life but have never known there were beautiful parks on Mt. Washington with incredible views of the city. Emerald Park was one of them and we rode perfectly manicured trails and gravel paths with a stop for lunch at Red Beards Bar and Grill. 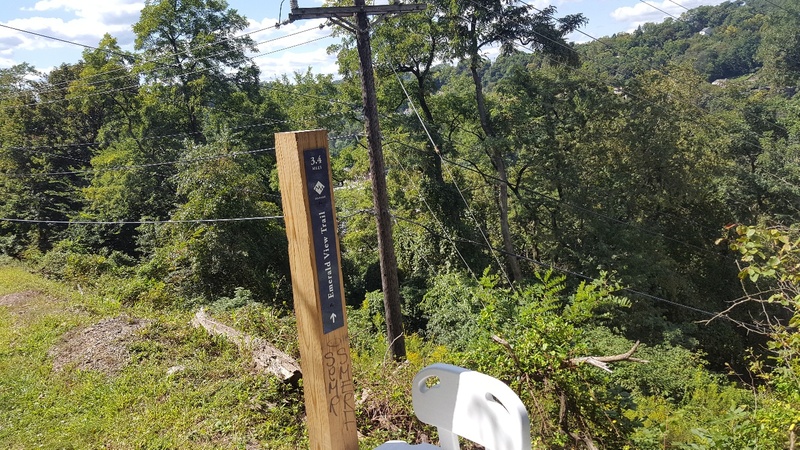 One of the cool things about Pittsburgh is the emergence of little outdoor cafes that are indigenous to the neighborhoods that surround the city. 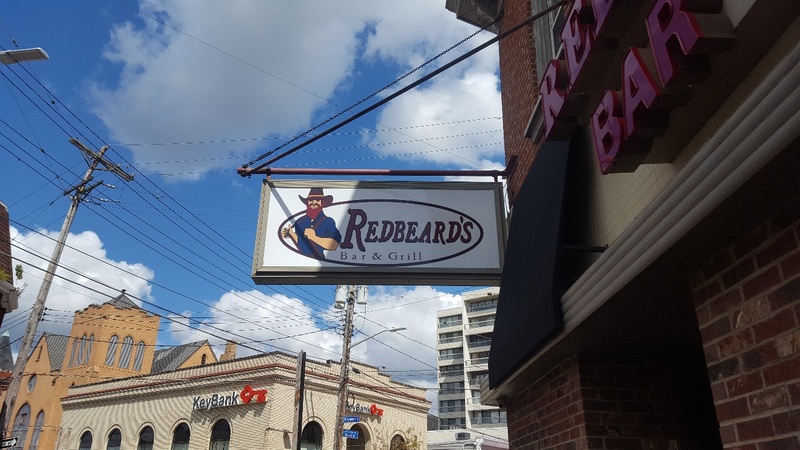 Red Beards is one of them and sitting outside at a table with a view of their outdoor “beach bar” was a relaxing experience. So much so, that I parted from my usual long ride protocol and had a cold draft with a sandwich to fuel the balance of the ride. After some further attrition due to family obligations, some of the guys departed after our visit to the mount. After a rapid descent down McArdle Roadway to the Southside, we made an additional stop at the OTB Cafe where I remarked to the young lady tending bar that a lot of us were patrons of the OTB in North Park. 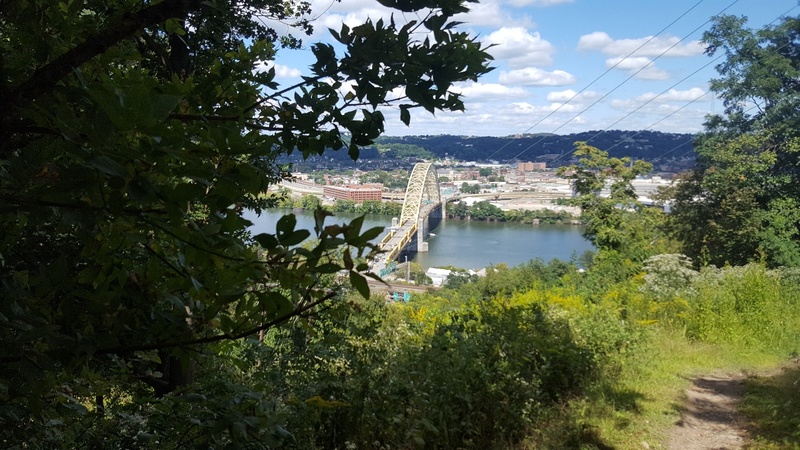 She said, ” Oh I see, you guys made a visit to the gritty, grimy OTB?” We laughed, I pounded a Coke with a lime, and we proceeded to climb into Panther Hollow near the University of Pittsburgh campus. 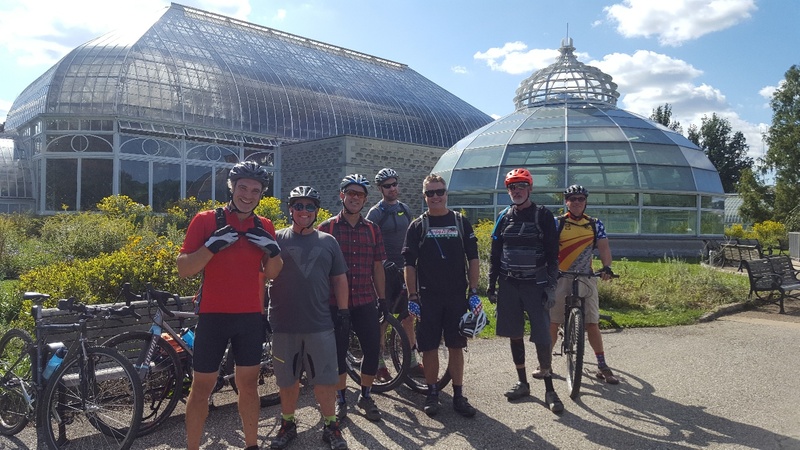 Assembling at the iconic Phipps Conservatory, we made our way through the scenic trails of Schenley Park and Frick Park. Both of these parks are well ridden and maintained by city mountain bikers and offer some technical terrain that rivals any city park in the country. After further attrition due to the fact that it was now about 6:00 PM, we were down to 8 riders to which Mark,” the Shark” Sauers, remarked, ” Hey – I made it to the elite 8.” We all laughed and although Aaron and Fred Fischer took an additional trail as the rest of us took a breather at the bottom of Frick, we all made our way to Highland Park for the final city park visit. Riding with the cool breeze and realizing that the fabulous day was coming to a close, we exited Highland Park and as Aaron and Fred took one more climb up Stanton Avenue which is one of the climbs on the famous “Dirty Dozen” ride of Danny Chew fame. The rest of us booked down Butler Street to cross the bridge back to the brewery. Interestingly, the emergence of cafes, restaurants, and new places of business is evident as you make your way through Lawrenceville. 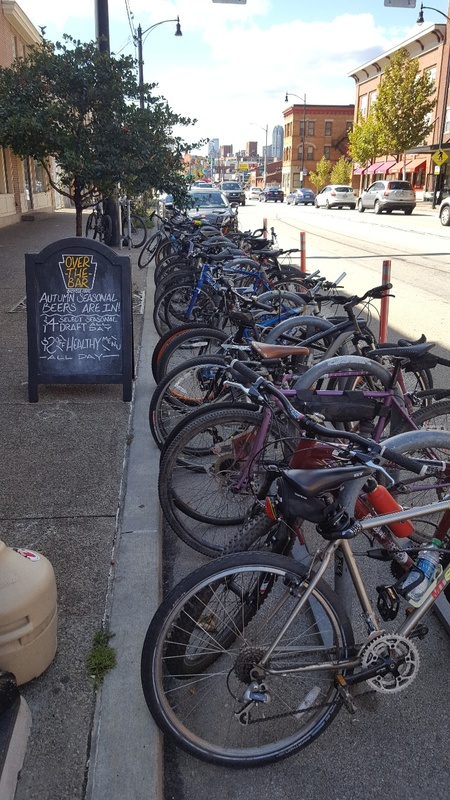 Once a declining, post industrial neighborhood, the resilient community has emerged as one of the more trendy neighborhoods in the city and what better way to investigate all it has to offer than from the seat of a bicycle. Pittsburgh is no longer the dirty, dusty, steel town of old. 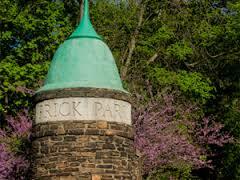 Continually rated as one of the better places to live in the country for many reasons,our city parks tour could be an attraction to the outdoor set visiting or contemplating relocation. At 7:00 PM with approximately 60 plus miles of road, gravel roads and trails, and 5700+ vertical feet of climbing behind us, the beers at the Grist House sure were tasty and the food trucks, which are a hallmark of the new style breweries popping up in town, had ample fare to satisfy the hunger of the Shafer riders. Moral of the story, get on your bike and investigate your city. 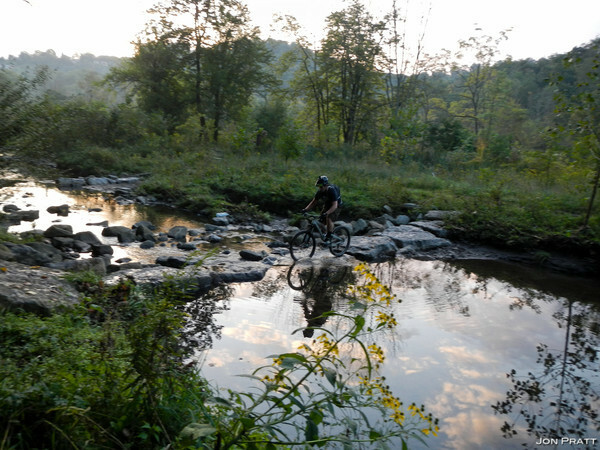 You will see things you never knew existed and if you come to Pittsburgh, get on a mountain bike and go for a ride. 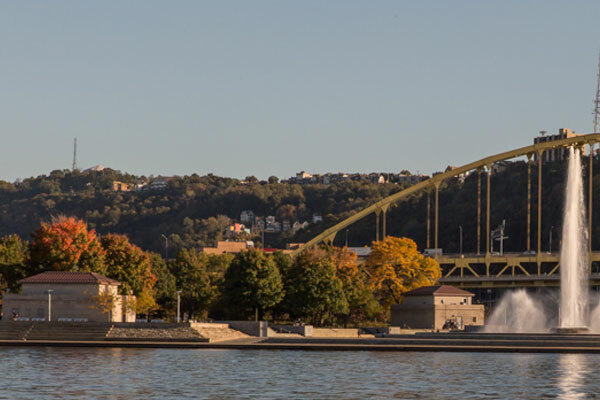 The city of three rivers will surprise you. Thanks for reading. Photos courtesy of Mark “the Shark” Sauers and Pat McCloskey. 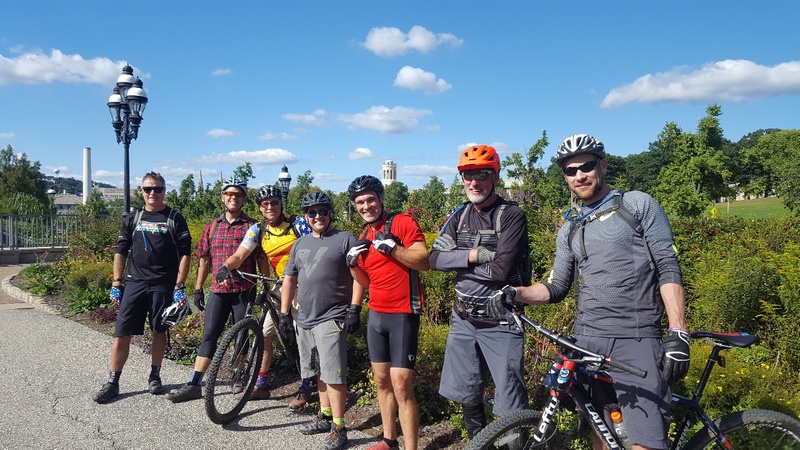 This entry was posted in Bicycling, Cycling, Health, Mountain Biking, outdoor activities, outdoor sports, Outdoors, Pittsburgh, trails and tagged Grist House Craft Brewery, OTB Cafe- Southside, Pittsburgh City Parks, Red Beards Bar and Grill. Wow, this was such a fun article to read. This recap has really made me wish I had a bike and was able to complete this tour with you. That looks like such a fun ride but hard going up some of those hills. I have to try Red Beards. I heard about that place. Nice post. 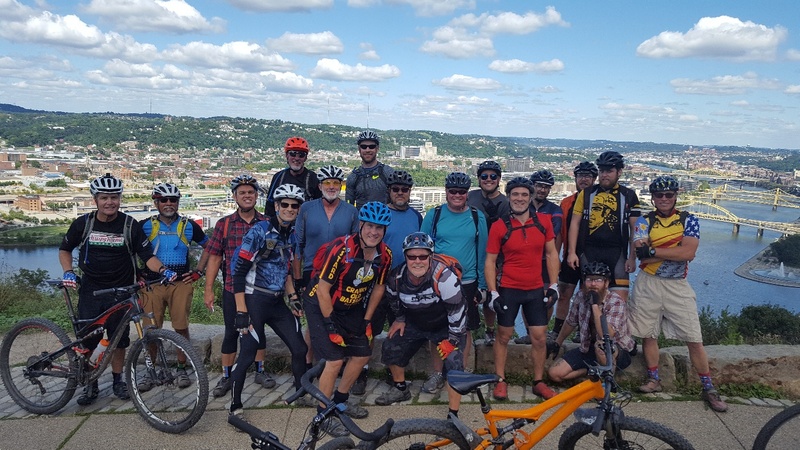 great read..love the tale and agree Pittsburgh is a great place to ride….. Thanks Mark. Ride the burg. Great story. Is there a map of you ride? Strava? I would like to ride portions of this route. John- I will see if I can get Route map from Aaron.